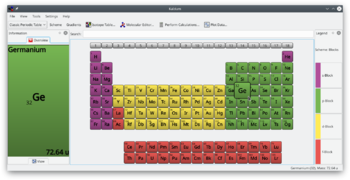 Difference between revisions of "Kalzium"
Kalzium is part of the KDE Education Project. Kalzium has already some nice features but there are still a lot of things to do. As Kalzium has been included in KDE 3.1 we are currently coding quite lot to bring in some new and nice features and make it as fast and usefull as possible. You can help us by testing it or make proposals for new features or a better design.